As world leaders and campaigners met in Copenhagen recently to discuss official commitments to climate change, a small group of Turn Lyme Green activists met in the Royal Lion on Broad Street. We know who makes more noise, but wonder if we can’t be the ones to make things happen?! Transition Lyme Regis has merged with Turn Lyme Green to form one group. It makes sense to pool resources and energy! For more information about Transition Towns, see www.transitiontowns.org. We are collaborating with half a dozen Transition initiatives in Dorset to get a fundraiser who could help us all, based in Dorset Agenda 21 offices (www.dorsetagenda21.org.uk ). 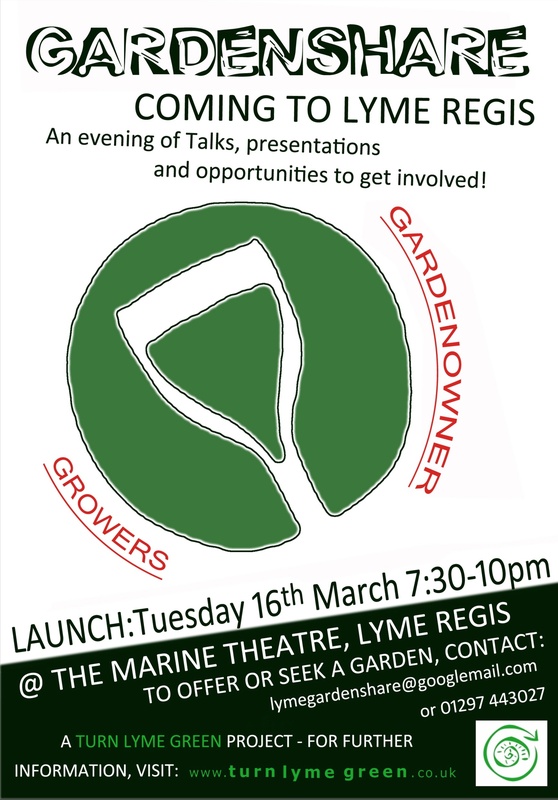 All are welcome to attend the launch which will feature videos and more information about garden share. Look out for more information on the web site next week. We began the winter programme of activities by joining in the first International Plastic Bag Free day (September 12th) and raised a few pounds selling our cloth bags. We had massive support again from most independent traders, and the Co-op. Tesco has said it would do much to support our efforts at becoming plastic carrier bag free but we haven’t seen evidence of that yet, despite senior level commitments. You can now buy Turn Lyme Green bags at the new Eco-store in Broad Street, which will be setting up a community notice-board. To join in with the international Climate Change campaign to reduce carbon emissions to 350 parts per million (www.350.org) the beach saw a group of supporters face the wind and rain on 24th October, to take 350 footsteps in the sand and sing a song of harmony. We have continued to work on local food and food production. We screened Rebecca Hosking’s film A Farm for the Future, followed by a discussion about permaculture and how to farm in a post-oil economy, led by local permaculture teacher Aranya. Most of the apple trees we planted in Anning road thankfully survived the initial vandalism, and we are now planting another six trees on Magna Housing land. We are still pursuing sites for a farmers’ market, and we are in discussion with a likely venue – watch this space! We are continuing to support efforts on recycling in Lyme, including the possibility of compressing the styrofoam used mostly by fishmongers – and takeaways – an idea initiated by Simon the fishmonger. We are researching the statutory household recycling facilities of other local authorities with a view to renewing pressure on our district authority. We are arranging to show the film, Age of Stupid (www.ageofstupid.net ). This entry was posted in TLG Archive. Bookmark the permalink.